Michael Parker began as Headmaster of Newington in January 2019. The significance of being commissioned as Newington College’s 19th Headmaster underscores to me the privilege and the responsibility of taking on this role. I am aware of and grateful to the 18 Headmasters who came before me who built the school into what it is today – particularly the 18th, Dr David Mulford. I am honoured too to return. I first joined the Newington community in 2002 and stayed for five years. I came to love and appreciate what was special about Newington and it’s fair to say I have a bit of ‘black and white’ running through my veins. I have also inherited a set of Newington connections by marriage. My mother-in-law, Jan Morrison, was the exceptional Head Librarian here in the 1980s and the first female head of department in Newington’s history. Newington was her community. My brothers-in-law came here and my wife Fiona – as the vice-captain of MLC Burwood – was a member of the Newington College Chapel Choir. She travelled through Europe with them and sang in the Notre Dame Cathedral with them at Christmas. I am pleased, though, that she didn’t marry a Newington boy. Since I have returned I have been impressed with the vibrancy, the energy, the diversity and the standards at Newington. In fact, the highlight of my return has been meeting so many students and learning more about them. I really appreciate the collegial welcome I have received from our excellent Common Room. I have also had good conversations with about 150 of our students … so far. It is still only 10 per cent but it’s early days. I apologise to the students whom I have introduced myself to twice – and in one case three times. I promise I am working hard. Whether it’s a game plan for cricket, the shades in an artwork, the book you are reading or the mountain you trekked in Nepal, I have enjoyed every single talk. It would be premature for me to have a clear vision for Newington at this stage – in fact it would be quite worrisome if I did. I am really busy listening as hard as I can to what people feel and what they have to say. However, there are a number of things I believe about education and schools and I would like to share some of them with you. I believe our civilisation has a great deal to be proud of and a little bit to be ashamed of and that it is the role of schools to pass this on from generation to generation so our young people don’t think we actually turned up on this planet three weeks ago last Tuesday. On the pride side there is our science. We humans have stood up from our caves and, in a blink of an ecological eye, looked out and around and worked out how the whole universe works. There is the stirring ethics of our religious and philosophical figures. There is the elegance of the Maths we have plucked from the ether and the beauty of our art, our music and our writing. There is the eventual triumph of a fragile liberal democratic system that allows many of us to live with laws, dignity and mission for our whole lives. However, it’s not just a triumphal march. Our shame file includes our history of race and gender relations, some nonsensical wars and worse and our dark tendencies towards fascism that remind us all that we, as a species, must be forever vigilant. I believe it is a school’s role to pass all of this on. Many 50-minute blocks during every day at schools are used to examine these foundation stones on which we stand and I, for one, am loathe to let any of those 50-minute blocks just slide away. However, I believe schools need to do even more looking forward than looking back. We can’t see the future, but we can predict enough to be nervous and excited in equal measure. Whole industries will continue to disappear and appear; truth risks becoming an ever more malleable commodity; social mores will increasingly be questioned; planetary problems – in a world still locked in nation states – will require planetary solutions and technology will confront, and offer up to us, the very limits of what it is to be human. And this is just what we know. I believe schools have to prepare the next generation for a future they can hardly see. To do this, paradoxically, I believe we have to reach – not out, but inside and explore what makes us human – what it is to ‘know thyself’. This is what will shape the visionaries, the leaders and the citizens to inhabit the 21st century. So, for a start, I believe schools everywhere should be committed to students’ sense of community and real connection in the face of galloping isolationism. At good schools, we want people to find their human connections in themselves, their family, their teams, their school, their colleagues – as well as their country and their world. Secondly, I believe schools should be committed to rousing creativity and rigorous critical thinking. People’s minds should be like fireworks and steel traps at the same time. This includes understanding the difference between facts and opinions, truth and fake truth, and finding proper evidence in a world where the news cycle can be like a pile of trash in a hall of mirrors. Good schools and educators are committed to principled reason instead of thoughtless adherence, and to original speculation instead of passive acceptance. Thirdly, I believe schools should be committed to hard work and rigour. We have no idea what young people are ultimately going to work at in the 21st century but we do think it is going to be tough out there, so people are going to have to stretch themselves and stick at what they are doing. Good schools get students to practise that in their classes, on their sporting fields and on their stages. Many Newington students are not strangers to this – indeed I am almost in awe of what some manage to fit into a day. Fourthly, I believe schools should walk beside students in their diversity of faiths as they seek out the answers to the largest, most fundamental, spiritual questions in life. We can’t abandon the next generation to an unthinking materialism in which having more ‘stuff’ is the meaning of life. In Newington’s Uniting Church, Wesleyan tradition, and with our chaplains speaking about God each week, we are committed to planting seeds that may grow – immediately or even decades later. I also believe schools need to keep values front and centre if they are serious about making students the very best versions of themselves for this future. This is tough, because is easy to find a list of 30, 50 or 100 abstract nouns that describe values – loyalty, justice, courtesy, generosity and more. But to make all these fine words make a difference here, schools must find ways for students to practise these values. And they did. They ‘couraged’. I have been talking about young people – but I want to finish by talking more directly to the young people right in front of me at assembly now. We want your years at Newington to be as good as possible for you. We want your teachers to be not your judges or your gaolers, but your coaches, your advocates and your mentors. Us older teachers might have seen it all before, but we have never seen you before- because you, in this place, are unique. We want to walk alongside you for those remarkable years; for the highs when you get into that team or get your driver’s licence, or the lows when your partner breaks up with you by text or you get a lousy exam mark. We want you to make a bunch of mates who might last with you throughout school and for your decades as an Old Boy. We want you to be friends with people who are nothing like you – who are bad at the things you are good at or good at the things you are bad at. We want you to look forward to getting up in the morning, even on that cold rainy Tuesday morning in the middle of Term Three, because Newington is where your people, your passions and your purpose all are. It is an honour to have been commissioned as Newington’s 19th Headmaster. I accept the role with the gravity it deserves, the dignity it demands and the potential it promises. The links from the first Headmaster Rev Moulton in 1863 to this day in the second decade of our 21st century remain unbroken and I commit to serving Newington College to the very best of my ability in the years to come. To read past messages from the Headmaster, click here. Michael holds a combined Arts/Law degree and a Masters of Education from the University of Sydney. Whilst at university, he worked in one of Australia’s leading law firms before pursuing his passion for education. He taught English and served as a Housemaster at Cranbrook before travelling overseas to take up an exchange position at Eton College. In 2002 he joined Newington, where he was a highly successful Head of English and the subject of the SBS documentary ‘Inspiring Teachers’. He has a healthy level of Black and White running through his veins as a result of his time here. After five years in that role, he was appointed Deputy Headmaster at Cranbrook, where he served for seven years before progressing to become Headmaster at Oxley College, Bowral, in 2014. 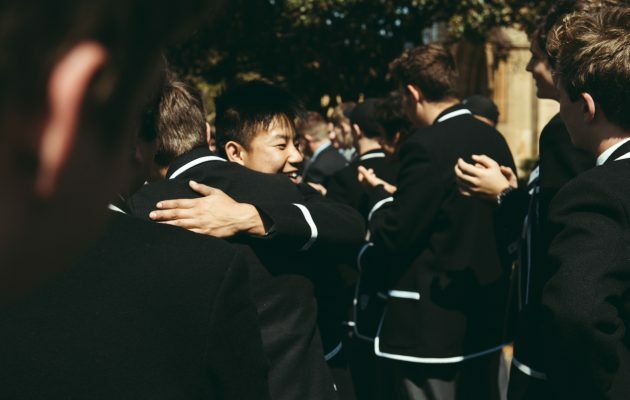 Under his leadership, Oxley’s academic performance and survey results across students, teachers and staff rose markedly. Michael is the author of 10 books, most recently Talk With Your Kids: Conversations about Big Ideas and Talk With Your Kids: Conversations about Ethics. His YA novel Doppelganger (Penguin) was shortlisted for the NSW Premier’s Award in 2007 and his children’s book You Are A Star (Walker Books) has been published in the US, UK, Brazil, China and Korea. He is widely travelled, particularly in the Himalayas, with four major treks under his belt, including past Camp One at 20,000 feet on Mt Everest in Tibet. He is married to Fiona, an English literature academic at UNSW, and has two teenage daughters, Julia and Elena. Michael is committed to open engagement with students and the school community at large. He is a strong believer in creating a teaching environment that engenders critical thinking among the boys. His aim is to foster a culture that combines improved academic performance with enduring pastoral care programs to ensure our boys are prepared for an unpredictable and constantly changing workplace.